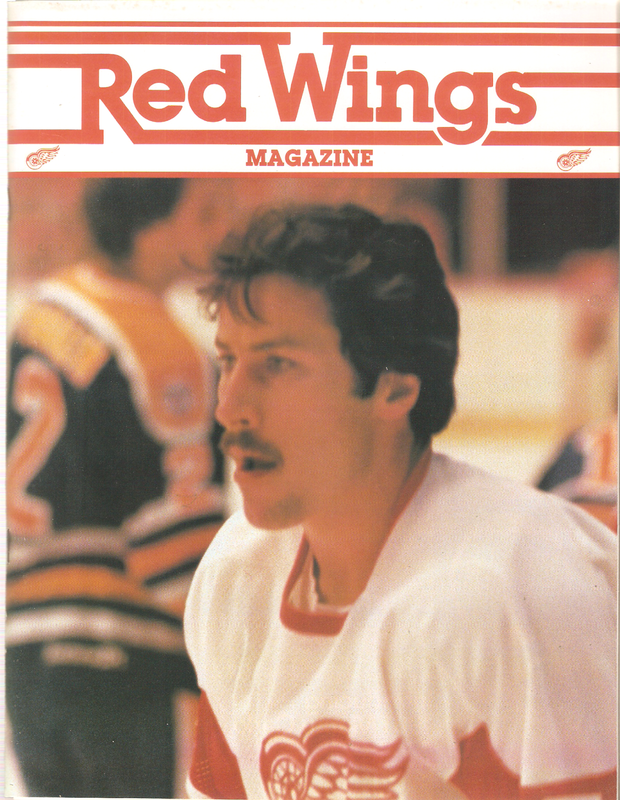 By 1980-81, the Detroit Red Wings were slowly reaching the end of their "Dead Things" era. From 1966-67 to 1985-86, the Wings missed the playoffs in all but four seasons. A myriad of coaches and general managers had come and gone during that era, and the Wings remained buried deep in the standings. 1980-81 was more of the same, as the Wings retained control of the Norris Division cellar, with an ugly 19-43-18 record. In most seasons, that would have given Detroit the #1 overall pick, but Winnipeg was especially horrific in 1981, winning only nine games. The Wings were four points behind fourth-place Hartford, but 47 behind first-place Montreal. Jimmy Skinner, former head coach of the 1955 Wings (the last Detroit team to win the Stanley Cup) was now the general manager. His former captain, Ted Lindsay, started the year as coach, but was canned after a 3-14-3 start in favor of Wayne Maxner. Didn't matter who was in charge. The Wings were a mess and their offense had all the firepower of a toy popgun, scoring only 252 goals, second-worst in the league. Leading the so-called attack was Dale McCourt, the #1 overall pick in 1977. McCourt, a dependable winger during the lean years, had 30 goals and 86 points. John Ogrodnick would chip in 35 goals that year as well. Young Mike Foligno was the only other forward with at least 20 goals (28), and underrated defenseman Reed Larson banged in 27. Big dropoff after that, though, as most of the veterans had disappointing seasons. The Wings had the sixth-worst defense in the NHL, allowing 339 goals. Most of the team was deep in the red on the +/- category, including Reed Larson, with an embarrassing -35. Gilles Gilbert, just two years removed from that heartbreaking "Too Many Men on the Ice" loss with Boston, took the brunt of the abuse that season in goal. Gilbert went 11-24-9 with a 4.01 GAA. Larry Lozinski was next in line, going 6-11-7 with a 4.32 GAA. Veteran Jim Rutherford, Claude Legris and Al Jensen also saw time between the pipes. Once again, the Wings failed to make the playoffs that year. But, thanks to a free agency mess in 1979, the Wings couldn't benefit from the #2 overall pick in the draft. Due to the Wings signing goaltender Rogie Vachon in 1979, the Kings countered by claiming McCourt. McCourt refused to report, and both teams made a deal: the Wings received Vachon and McCourt, the Kings helped themselves to Andre St. Laurent and the Wings' first round picks in 1980 and 1981. So if you believe the Wings are too passive in trades and free agency today, remember this one. This program is 62 pages long and is actually two programs in one. Inside is a copy of the NHL's Goal magazine, featuring the Capitals' Ryan Walter. The Capitals were the opponents for this game on March 26, 1981, and blanked the Wings, 2-0, in front of 12,813. Most of the pages are black-and-white, but quite a few are color. One unusual article is a "handwriting analysis" of the Wings' Jim Korn. Betty Goldner noted how "the emotional slant of Jim's handwriting analysis" showed that Korn was one that "does not show his emotions very freely". Also, Goldner wrote that Korn had "a very stubborn streak" and "enjoys activities that appeal to the senses such as good food and good company". Okay then. Local ads include Nemo's Saloon, Dino's Lounge, Taylor Sporting Goods and Vernor's Ginger Ale. Lots of liquor ads in this one too, which kind of made sense, since one likely had to have a few drinks to watch the Dead Things. Aftermath: The Wings would continue to struggle the following year, going 21-47-12. After the 1981-82 season, longtime owner Bruce Norris sold the franchise to Little Caesar's founder Mike Illitch. Illitch would then hire Jim Devellano from the New York Islanders as GM, and together would begin to rebuild the franchise from the ground up. By 1987, the Wings were in the Campbell Conference Finals, and Stanley Cup Champions ten years later. Illitch continues to own the Wings to this day. Goldner, Betty. "Handwriting Analysis of the Red Wings: Jim Korn".